With the introduction of the new Google Drive File Stream, Google completes the replacement of the Google Drive desktop app. It will be replaced by two new programs. Google Drive File Stream for businesses and teams using G Suite, and Backup and Sync for private users, which is already available since July 2017. Starting December 2017, the old Google Drive Software will not be developed any further. In March 2018, it will be discontinued fully. Boxcryptor now supports both versions now, so nothing stands in the way of your switch to either one of the new apps. Google Drive File Stream is the software for business, education, and enterprise users. It is not just the old client with new branding, but comes with additional functionalities. On demand files: Files and folders in File Stream are stored only in the cloud per default, and not synchronized to the device. This way, you save valuable space on your device. If you want to have your files available locally, you can change it in the settings. New administrative possibilities for administrators: From now on, you will find settings for Google Drive File Stream in your admin console for G Suite as well. You can manage the app centrally and control synchronization, or set the time for software updates manually. 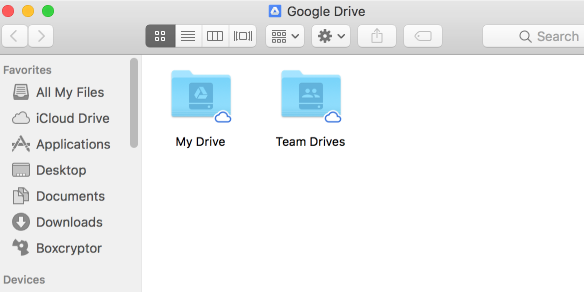 Team Drives: Team Drive is a new folder that does not belong to a single person, but to a group. Group members can easily store and collaborate on files there. Boxcryptor supports Google Drive File Stream with all its features on all platforms and devices. 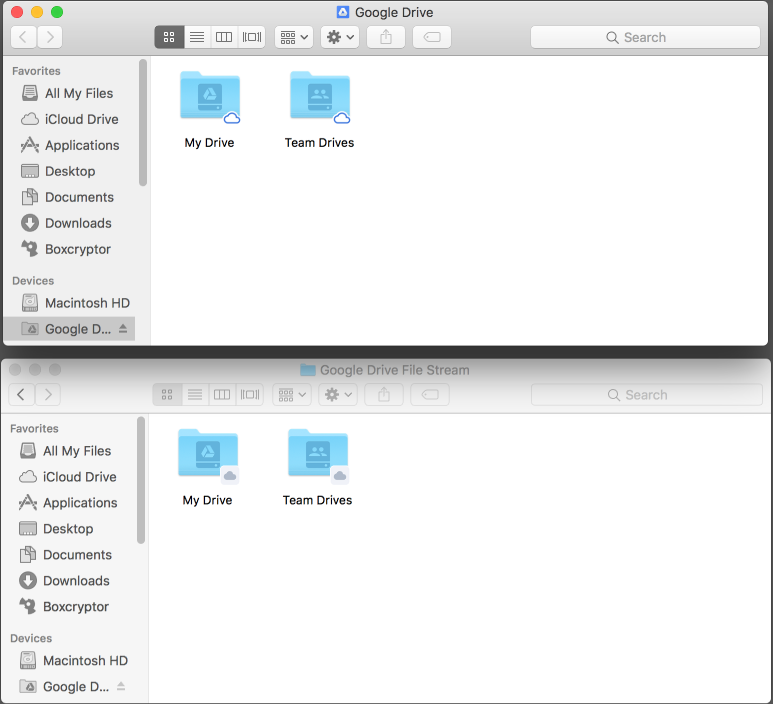 Both Team Drive and the new on demand system for files and folders are compatible with Boxcryptor. View of the folders on macOS, once in the Google app, once in Boxcryptor. If you want to make files available locally, you can adjust this in the Google Drive File Stream settings. In July 2017, Google released the new sync client for Google Drive: Google Backup and Sync. This new software replaces both the old Google Drive and Google Photos and comes with new features as well. Most importantly, the new software allows you to create a backup for your desktop and documents folder, as well as any other folder on your device. Hence the name: sync stands for the old functionality of Google Drive since it synchronizes all your data in your Google Drive folder to the cloud. You can access all your files wherever you are, no matter on which device. Backup stands for the new feature of securing additional folders. In case you lose your device, your data is not lost, but safely stored at Google. 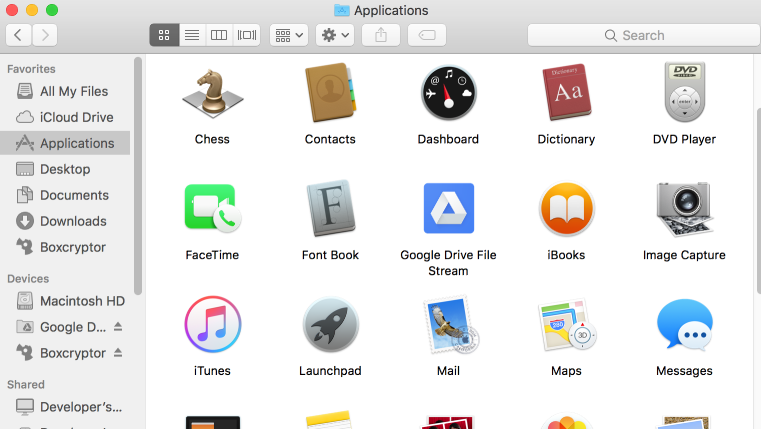 The Backups are – in contrast to the synced cloud folder – not synchronized to other devices. They are only available at drive.google.com. The word “safely” only fully applies to one aspect of your data in Google Backup and Sync: the aspect of physical safety. Your data is ideally protected from loss. However, for many, it is as important that their data is safe in the sense of being private and protected from access of others. You do not have that kind of security at Google, since the provider – Google – can access your data. In Google Drive (your sync folder), Boxcryptor can solve this problem for you, since it does encrypt your data in a way that no one but you can access it. However, Boxcryptor cannot offer this protection when it comes to the backup folders, since they are not cloud folders in the classical sense. Careful: The backup function is activated by default. Thus, if you do not want that all your data in these folders is synced automatically to Google, you should disable this feature. How this works and how you can still encrypt your local folders with Boxcryptor, is described in our article about Backup and Sync. With support for Google Drive File Stream, Boxcryptor is now compatible with all new Google apps fort he use of Google’s cloud service. 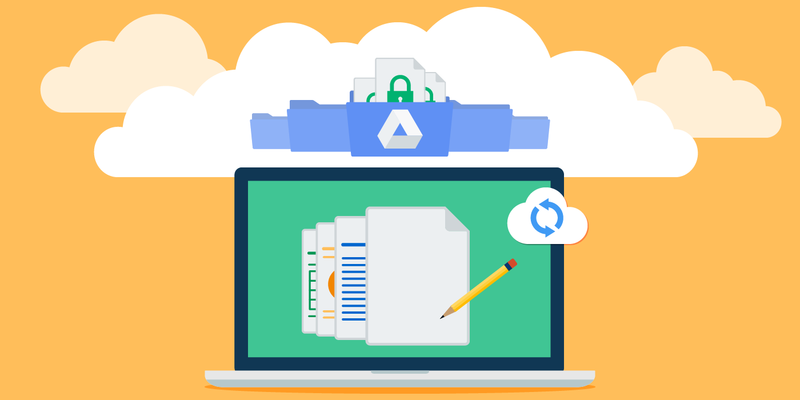 Private users can protect their cloud data with Boxcryptor in Google Backup and Sync, and business users in G Suite can use Google Drive File Stream securely encrypted. Install the latest version of Boxcryptor for Mac or Windows to start using Google Drive File Stream with Boxcryptor right away. You are not on board yet? Find out how companies can protect their enterprise cloud with Boxcryptor.